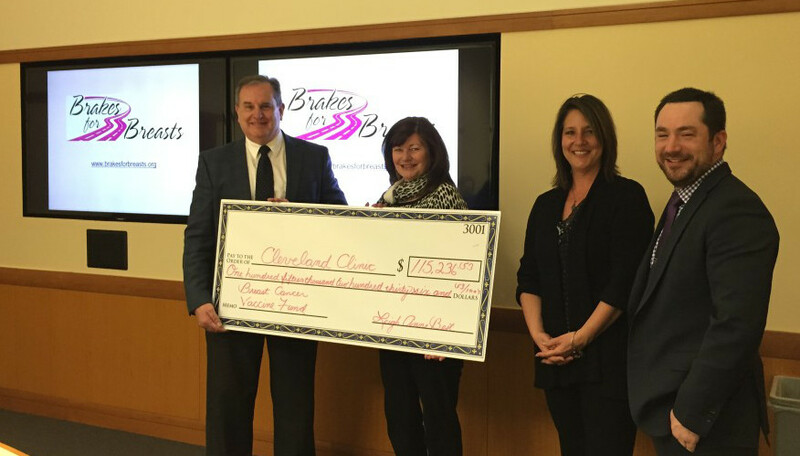 We are Putting the Brakes on Breast Cancer! During the month of October 2015, De Pere Auto and other Independent Auto Repair Shops across the U.S. [we are now up to 128 shops] are Giving Away Free brake inspections and Giving Away Free brake pads or shoes. During All you pay for is the labor and any other necessary parts. 10% of these proceeds will benefit the Cleveland Clinic Breast Cancer Vaccine Research Fund. Our group of auto repair shops from across the country have set a goal to raise over $100,000 in proceeds! This fundraiser will end October 31st. Make an appointment during the month of October and receive a FREE Brake Inspection. This is a $43.00 Value that you will be saving! If your vehicle needs brake work we will install FREE Premium Brake Pads on your vehicle, and you will save anywhere from $100 to $200 depending on your make & model & the work needed! For every Brake service performed at our shop, we will donate 10% of the proceeds to The Cleveland Clinic Breast Cancer Vaccine Research Fund! FYI, you can not combine other De Pere Auto discounts with this special fund raiser. ALSO, Please Note: We don’t do “pad-slaps” – if you need brake repair, we will be installing rotors with the FREE Brake Pads. Presentation of check 2014 -- $115,236.53! !